INGEN TILLGÄNGLIGHETER FÖR RENGÖRING ELLER FLYGGÅRD UTAN ANDRA UTHYRNINGAR !!! Om du söker efter. En lägenhet som har allt för det perfekta semesteret inte längre! Över 60 SVENSKA TV-kanaler att titta på !!! LJUS OCH LUFTMÄRNIG LÄGENHET MED MYCKET LJUS FRÅN VINDOR !! I varje rum !! Jag kan försäkra dig om att du kommer vara väldigt nöjd med den här lägenheten !!! APARTMENT SLEEP. S 6. Peole ..
Vi har högt ställning och COT på begäran GRATIS! Massor av internationella barer café restauranger på nästan alla hörn !!! Stort amerikanskt modernt öppet köpcenter la zenia .all toppvaruhus, även ett stort primärmark, 20 minuters bilresa eller bussresa! Torrevieja har också ett eget köpcentrum för habeneras. Clean, spacious and comfortable with a well equipped kitchen with washing machine. Quiet as not on main street but a good 15 minute walk back from the beach. Pool lovely, never too crowded but busiest after 6pm. Large TV and Wi-Fi was much appreciated by teenagers! A relaxing and great family holiday straightforward to book and Colin was very helpful, meeting us at the apartment on arrival. We booked this apartment quite late on and were a bit apprehensive as we normally stay around Los Locos and on the sea front. This is located more centrally but further back. It is about a 10 minute walk to the sea which is fine on the way down, although can be a bit more exhausting on the way back. That said, there are lots of bars and cafes on the streets if you need a break. The apartment itself was lovely. It is clean and well equipped with everything you need for your self-catering holiday. It is compact, but perfectly adequate for us as a family of four for 2 weeks. The décor is really nice and the huge TV was an unexpected bonus! 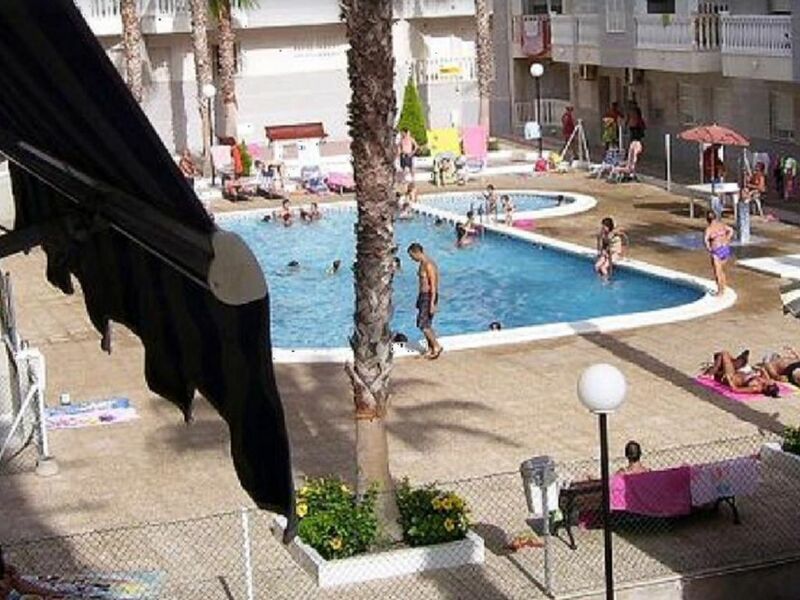 There is a pool on the complex and like most pools in Torrrevieja these days it is quite formally monitored with a pool guard to whom you must give a pool pass. No floats or lilos are allowed. The pool opens at 10 on the dot – it is enclosed by a fence so you cannot gain access prior to this time. From the apartment, access to the pool is a bit of a hassle as you will need 3 keys coming back (apartment door, complex door and pool area access gate). You have to go outside the front door of the complex and then back in via a locked gate to get to the pool. But again you get used to it after a day or two. Colin the owner was extremely helpful and a pleasure to deal with. I would have no hesitation recommending him and this apartment to anyone. Thank you I’m glad you had a great holiday. gott om parker för barn inom 5 minuters gångavstånd.